On Friday, 23 March, jazz maestro James Morrison came to Grammar for a special evening of musical fun. Mr Khusid, the School’s Director of Jazz Studies, has been a friend of Morrison’s from their early days at the Sydney Conservatorium of Music in the early 1980s, when both were taught by Don Burrows. Ever since, Morrison has been a generous supporter of our School, giving masterclasses at College Street and adding stardust to a number of our jazz concerts. 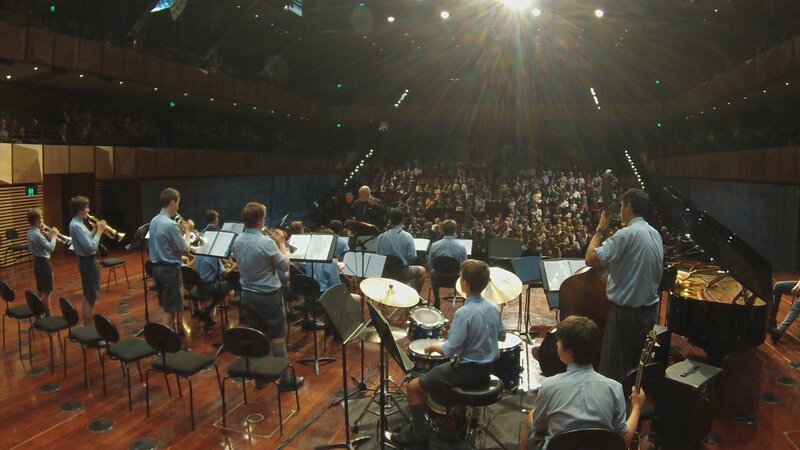 The School’s two large ensembles, the Stanley Street Big Band and the Sydney Grammar School Big Band, opened proceedings in the John Vallance Hall, with soloists Eamonn Murphy (flute), William Hobkirk (guitar) and Alexander Crawford (piano) turning heads with their fine improvisations. Morrison, conducting both bands, then invited Dr V’s Swing Thing, the well-travelled Old Boys’ big band, to the bandstand to perform some challenging jazz charts. Dr V’s performance was notable for a cameo by none other than Dr Malpass, a big band stalwart at College Street in the early nineties. Despite the limited practice time at his disposal nowadays, Dr Malpass showed impressive ‘chops’ with flugelhorn in hand as he burned his way through the Mark Taylor-composed jazz standard Lulu’s Left Town. The second half saw Morrison joined by his two sons William (on electric guitar) and Harry (on double bass), as well as singer Adelina Martinez and drummer Patrick Danao (drums). At the conclusion of their performance, during which even Chopsticks was given an extended ‘jazz’ treatment, Morrison then invited the SGS Big Band’s lead trombonist, Kye Milne, to share the stage with him. Milne, showing no signs of nerves, traded solos with Morrison over a spirited F major blues, with both trombonists exploring the upper registers of their instruments and wowing the audience with their inventiveness. For Milne, as for all of us, it will be a night that will live long in the memory.